The Global Fund to fight AIDS, Tuberculosis and Malaria presented its full Investment Case at the Preparatory Meeting of the Global Fund’s Sixth Replenishment, hosted by the government of India in New Delhi. This important meeting brings together civil society organisations, technical partners, governments and donors, like Luxembourg, to demonstrate worldwide solidarity and firm commitments to achieving Sustainable Development Goal 3, “health and well-being for all”, especially its targets of ending the epidemics by 2030. The Global Fund is aiming to raise at least US$ 14 billion for 2020-2022, a crucial time on the road to 2030. The challenges are not to be underestimated: there is growing insecticide resistance in bed nets, drug resistance in treatments for all three diseases, millions of unreported and thus untreated TB cases, and gender inequalities and human rights barriers, all of which impede necessary interventions to reach key populations, including women and girls. Coupled with underfunding, these challenges are already slowing and threatening the remarkable progress made by the Global Fund partnership: 27 million lives saved and mortality rates from HIV, TB and malaria drastically cut by a third. The Investment Case for the Sixth Replenishment is an urgent call to step up the fight against the diseases and to get back on track to ending them as public health threats by 2030, which is possible if all partners scale up their commitments. With a successful replenishment, the Global Fund partnership “will help save 16 million lives, cut the mortality rate for the three diseases in half, and build stronger health systems” according to the Investment Case, as well as “spur domestic investment of US$46 billion toward ending the three diseases and strengthening health systems through co-financing requirements, and technical assistance on health financing”. Luxembourg has answered the call. The first country to make a pledge, Luxembourg announced € 9 million for the upcoming three-year cycle. 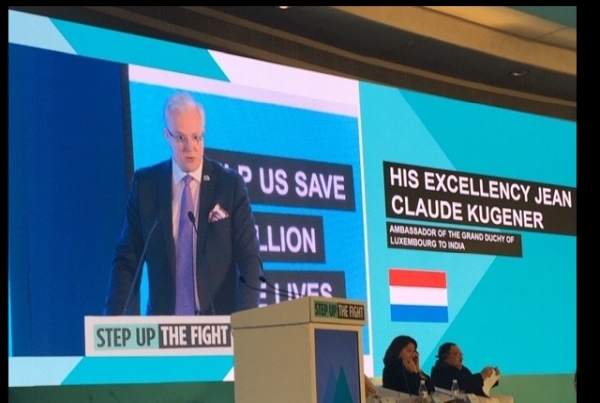 Luxembourg’s pledge, announced by Ambassador Jean Claude Kugener, is an 11% increase over its previous pledge of € 8.1 million for the current period 2017-2019. As of 2018, the government of Luxembourg has contributed a total of € 39.5 million to the Fund and remains one of the most generous per capita donors.